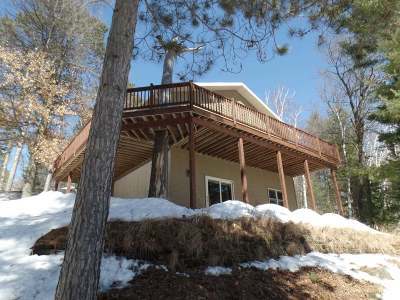 Shh Don&apos;t Tell the Relatives, that you purchased this 2 bedroom 2 bath home on the Rhinelander Flowage! They will be at your door wanting to take advantage of 133&apos; of frontage on Boom Lake, fish from your boathouse, relax in the finished basement, enjoy the wall of windows, cathedral ceilings, open concept kitchen, living room and dining area! They may just NEVER leave. This Waterfront Property has it all!!! Custom built in 2013 with nothing forgotten! Hurry now and schedule a showing, this home will not last long!